Defender Gareth McKeown has left Glenavon to join Carrick Rangers after struggling to secure a regular starting role with the Mourneview Park outfit. The 32-year-old joined the Lurgan Blues in 2013 following a successful spell with Crusaders. 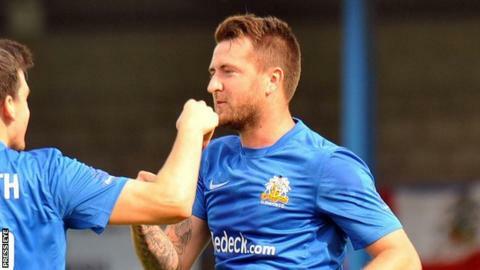 "Gareth was one of a number of players I brought in to change the mentality at the club," said Glenavon manager Gary Hamilton of the versatile defender. "He had experience and most of all knew what it took to be a winner." "Gareth played his part in out Irish Cup winning team and has given excellent service to Glenavon since he has been with us. "We were not seeking to let him go, but he approached us a few weeks ago to seek a move that would help him play regular first team football," Hamilton told the News Letter. Carrick are struggling in 11th place in the Irish Premiership table but have several matches in hand over their relegation rivals because of ongoing problems with their pitch at Taylor's Avenue. Glenavon have also released Kyle Buckley, who has re-joined former side Ards.